Is Sainsburys.co.uk down today? If you visit their website you will notice a maintenance message when the online services are offline, which can be due to scheduled work to servers or even in some rare cases an attack of some sort. In most cases the UK shopping website only goes offline for a sort time. This is for regular maintenance and to add new features, or fix bugs for improved customer experience. When Sainsburys.co.uk is down for maintenance, you’ll still be able to use their Help Centre and read about the online shopping experience. If you notice the Sainsburys UK website down, or if it has come back online, then share a comment to let others know. If Sainsburys is down today, then reports will be found below. In the middle of an order and the site has crashed.. Now I can’t get back in !! Have been trying to order groceries online last night the site went down, tried again since 4pm just now and it still down. The same story as Tom in London. I’m in Lincolnshire, at 10.30 half way through making an order the site went down. No idea how long it’ll be down so I’ll probably drive down to Tesco’s instead. Unable to book a Sainsburyâ€™s slot on their app today-is the site down? its business and nothing to do with you. so keep your nose outta it! If you use the website instead, which the app directs you too, it works fine. Oh grow up you spoilt brat. There are people in the world whom are starving. Shame on you. Iâ€™m off to Tesco too! down today when i need food delivered for tomorrow evening. if its not back up by 4pm i will go to tesco and you would have lost a customer who spends Â£120 a week on food. Same problem when trying to check out. Says items not available for delivery date. Would not let me change the date. Had to remove order, then changed the date to later next week. Same message on checkout. Problem seems to be related to the more perishable items. Haven’t seen any apology from Sainsburys. Needs a big bold apology at the top of this page, and an ETA to solve it. I have the same problem: unable to check out without confirming changes/product unavailibility which amounts to my entire order! I have logged off and on and tries via a different browser. Tried to update my order but it wonâ€™t checkout without trying to replace half of my shopping. Tried doing it on the app & desktop website. Need it fixed ASAP! Website / app / phones – all not working canâ€™t check my shopping out – I only have 26 mins left!!! I’ve been trying to register with the smartshop app for 2 days now and it keeps gving me the same ‘sorry there was an unexpected error’. i’m about to give up. Tesco’s app worked perfectly. is it just me? It’s slow as chuff lets you load the basket,,,, come to checkout…. goes through the secure code ball ache, then bam,,,, gateway timeout. This happens nearly every week. Maybe it’s because I do mynshop on a Sundays and they turn off the lights? Order failed to show between 9 and 10 pm last night and heard nothing since. Impossible to get through on the phone so don’t know if order will arrive. One expects problems, but this is appalling customer service. I am an online team leader working within sainsburys. We have had technical issues today, resulting in all online picking systems not working. All shopping has had to be paper picked instead of using our online shopping handsets. It takes so much longer to do so. Please believe me when I say the stores will be doing 10 times as much work as usual to get your shopping to you. Have you tried to call your local online store instead of the contact centre for an update, might be worth a try. I have nothing wrong with getting onto the website but damn trying to access the online banking seems to be somewhat of a pickle. No idea whats going on. (SAINSBURYS online problem) Apparently, the problem is to do with a few customers’ card details. Their system is not able to accept (selected???!!) card details, so you need to speak to a customer advisor and they have to enter the details onto your account for you. Then you should be able to checkout properly. With mine, when I checked out, it gave a different error message about my payment but the order did go through (as confirmed by the advisor). Hope yours goes well…. Thanks, Bab. Aren’t Sainsburys fixing it??? (not really a question for you). I’m trying to contact their phone helpline. Will update later. Siansburys groceries does not take payment due to technical glitch, which has now been there for nearly 4 days! Is there a problem with the online grocery payment system at the moment? It keeps saying it has logged me out for inactivity — I have tried re-logging-in, and using a different browser, but am getting the same error again and again…. 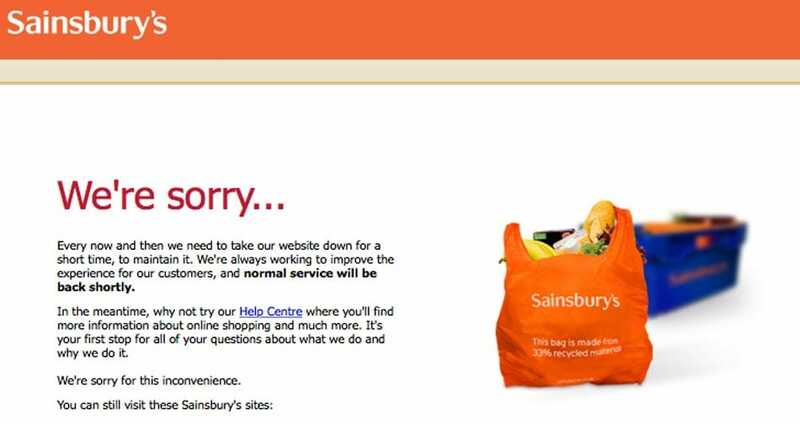 Is sainsburys website down today thurs 9th Feb? Could not log on last night or today. I have booked a time slot for delivery but I can’t add anything to my trolley. I know people go crazy at xmas time but surely there is something left? sainsburys groceries down!! Just finished shop and logged me out, now I can’t get back on!!! incredibly slow tonight: ‘sticks’ and tells me it’s ‘updating’ it bloody isn’t, I have to reload the page every damn product…..getting very annoyed with this! WTF is going on- I have good connection with everything else…. My Sainsburys login is not working, I want to order a shop and cannot. I have tried on laptop and mobile phone and still not working. Sainsbury’s website is down for me, whats going on. Are the servers offline due to maintenance or updates? I am looking forward to the Sainsburys Boxing Day sales 2015, but what I am not looking forward to is the website going down s this will not allow me to search for the deals. Will the Sainsburys website be able to handle the traffic this year? Getting “The requested URL was rejected. Please consult with your administrator.” was working until 10 mins ago. Is Sainsburys going to add some sort of countdown timer on its website to let us know we are in a queue like a few other stores did online last year? Just tried to submit online assessment for groceries online shopper at Ellesmere Port – completed all ?aire and then received fault message as I pressed submt. Can you help ?